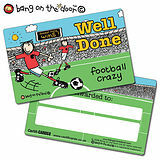 You can use this great Bang on the Door football crazy 'Well Done' CertifiCARD to reward your pupils, whether they have created exceptional work in the classroom, gone the extra mile for a fellow pupil or teacher or behaved impecably all day. 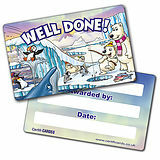 These CertifiCARDS can motivate your pupils to be hardworking, kind and well-behaved every day. Each card is the size of a standard playing card (86mm x 54mm). 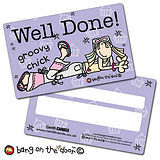 Each card has space to add the pupil's name and the reason that they have been presented with the card.